Cinnamon Roll Waffles: Try this crazy waffle recipe using canned cinnamon rolls and a homemade maple cream cheese syrup to create the ultimate breakfast combo! 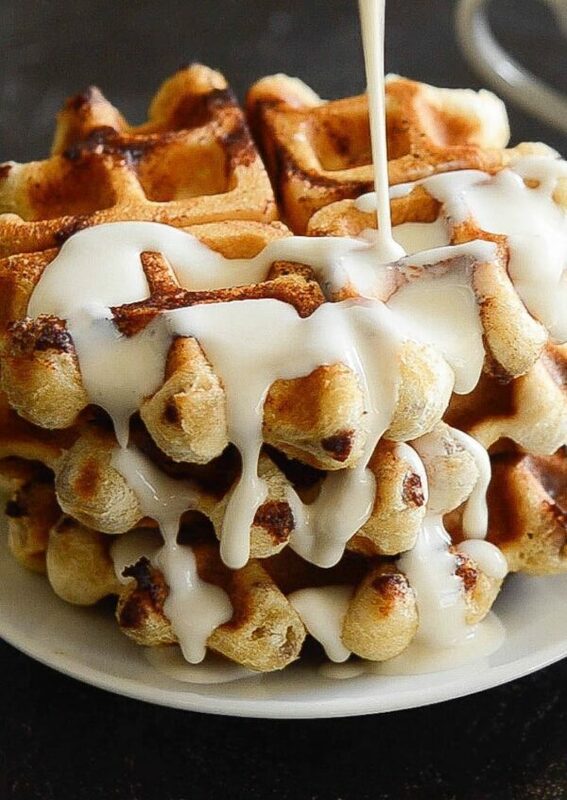 Yes, you read that right…CINNAMON ROLL WAFFLES. Made with canned cinnamon rolls. I truly did make waffles with just one ingredient – a can of cinnamon rolls. Is your mind blown yet? Mine still is. While you may think they are too simple to taste good, trust me, they actually taste amazing. If you want to get fancy, you can make a 2 minute Maple Cream Cheese Syrup to drizzle them with. It’s divine and worth the extra step. However, if you really feel like phoning it in, you can just use the cream cheese frosting that comes with the cinnamon rolls. To be totally honest, I almost always have a can of biscuits or cinnamon rolls hanging out in the bottom drawer of my fridge for an easy Sunday morning breakfast. They always come in handy when I don’t feel like making an entire meal myself, but I had never made my cinnamon rolls prepared this way before. I was nervous that this might be one of those Pinterest flops we have all made and been disappointed by before. As soon as I opened the waffle iron and saw that perfectly golden waffle with a cinnamon swirl running through it, I knew it was a winner. I wish I could claim responsibility for the brilliant idea of stuffing a cinnamon roll into a waffle iron, but I actually saw it on pinterest. I tried looking around for the original creator, but kept winding back up at Pillsbury. If someone knows who actually came up with this brilliant idea, please let me know. Would love to give them credit! 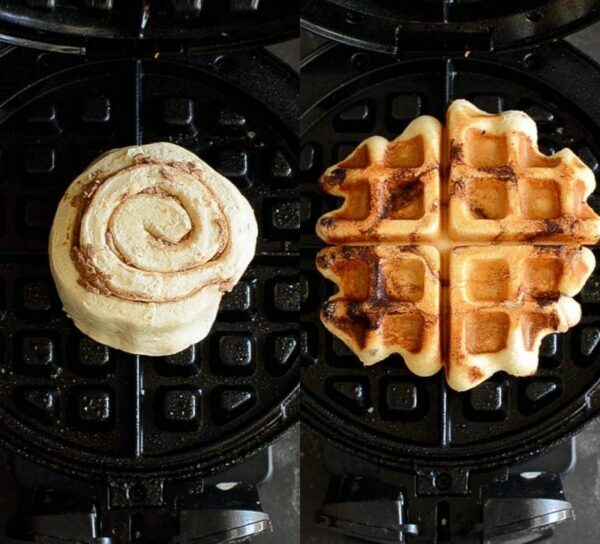 Why should I cook my cinnamon rolls in a waffle iron? If because I said so isn’t reason enough for some of you, let me explain why you want to try this recipe. First, it tastes amazing. I actually liked this better than the baked version of a canned cinnamon roll. To me, a cinnamon roll needs to have an ooey gooey center and be super soft. And to be honest, most canned cinnamon rolls aren’t like that. So, making them in a waffle iron takes them to the next level and takes out those expectations. Second, they taste AMAZING as a waffle! Canned cinnamon rolls truly make the perfect waffle if you can believe it! Soft tender inside, crispy perfect outside, with a delicious cinnamon flavor! What more could you ask for? Oh yeah, that’s right, you could ask for Maple Cream Cheese Syrup to drizzle on top!! Yes, if you want to, you can absolutely use the jar of cream cheese icing that comes with the cinnamon rolls. Or, you can even just use plain old maple syrup,, both are good options that will give you a tasty finished product. However, it’s incredibly worth it to make your own cream cheese syrup flavored with real maple syrup. It takes about two whole minutes to whip together and tastes just as amazing as it sounds. 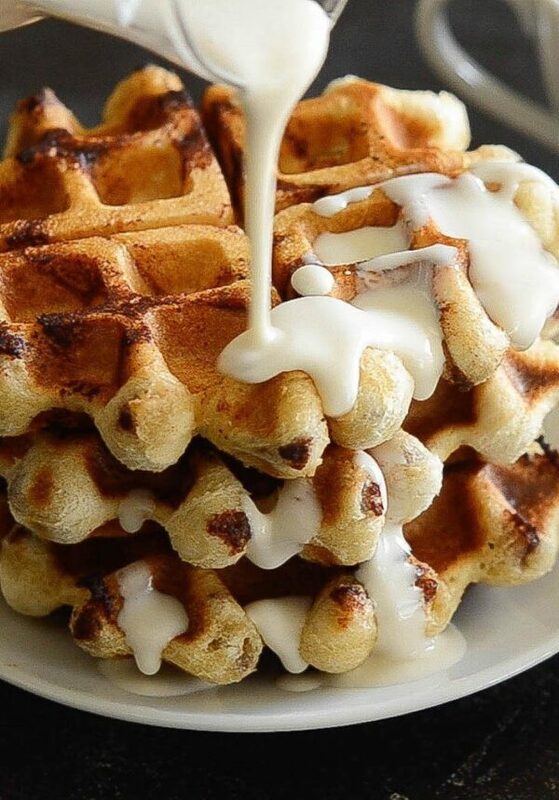 These Cinnamon Roll Waffles with Maple Cream Cheese Syrup are everything you want in a weekend breakfast. They are incredibly easy to make and are on the table in a matter of minutes. I even made a new video to show you all how simple they really are to make! 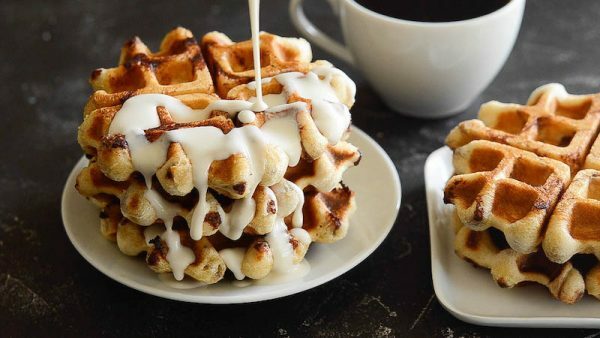 I just know that you and your family are going to love these epic Cinnamon Roll Waffles as much as we do. 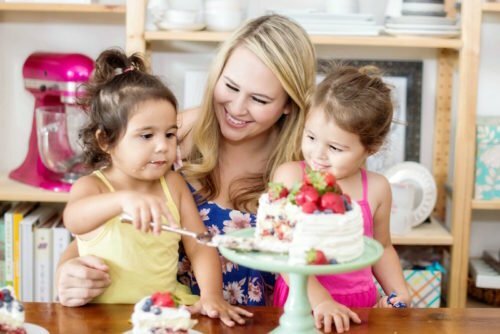 Plus, they are so easy, your kids can help! Or, if they are old enough, they can even make them for you while you are still laying in bed on a lazy Sunday morning. Using a hand mixer, or stand mixer, beat together cream cheese, powdered sugar, maple syrup, milk and maple extract (optional) until smooth. Set aside. Heat waffle iron. Spray with non-stick spray. Place one cinnamon roll in the center of waffle maker. Close waffle iron. Cook for 2 to 3 minutes, or until waffle is cooked through and golden brown. Continue until all waffles are cooked. 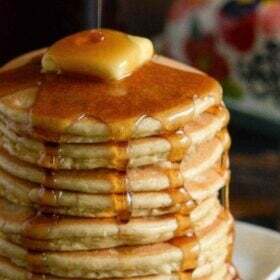 Serve warm and drizzle with maple cream cheese syrup! Recipe note: the amount of waffles made will depend on the number of cinnamon rolls in your can. I used Pillsbury Grand original cinnamon rolls. I have also tried it with the Cinnabon version and they are delicious as well! These waffles look ABSOLUTELY amazing! And yes, yes I do want to get fancy. I think getting fancy shouldn’t be an option, it should be absolutely required with these waffles. I love this idea. It never occurred to me to put these on a waffle iron. I can’t wait to try this and that yummy syrup. Brilliant idea! Where did you learn to create such great videos? Holy moly!! I want these for breakfast! I think I’ll win mom of the year when my boys see this on the breakfast table!! I better be prepared and make a bunch. They look amazing!! That maple cream cheese syrup sounds amazing! It would even be good on regular waffles too! This is just BRILLIANT! What a combination! And what a way to start the day! Our family made these tonight and they were soooooo good! 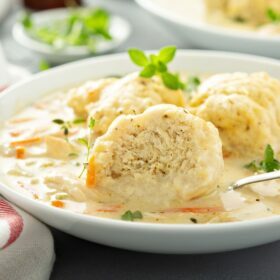 Dang, I want these right now for dinner! 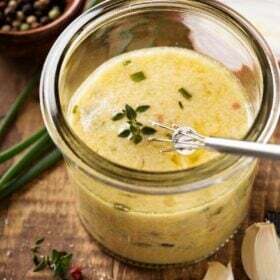 So quick and easy – perfect! I think I may have just found my favorite flavor of waffles! 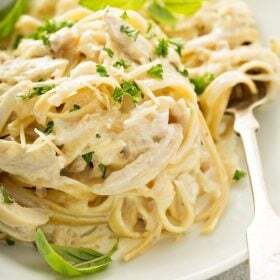 This recipe is amazing and I must try it ASAP! Pinned for later!! YUM! My husband loves cinnamon rolls and we make waffles about every weekend. 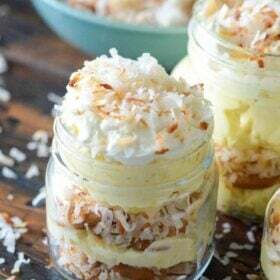 Making these this weekend! Thanks for the recipe! WOW, I am definitely going to try this. It’s so easy and I absolutely love cinnamon roles. Thank you for this quick and easy recipe. 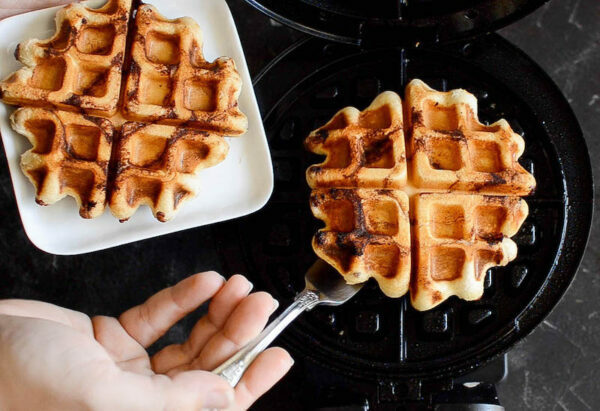 Can you use a Belgium waffle iron ? WOW this I must try out some day. It is looking jummy. This has been our Christmas morning breakfast for years. I will have to make the maple syrup as it looks wonderfully tasty. The look delicious, however they make a mess of the waffle 8ron. 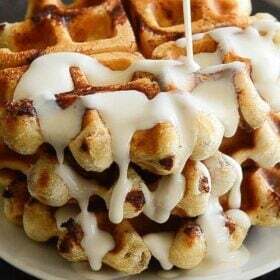 I must try these cinnamon waffles! Looks delicious! How long do you cook them in the waffle iron?